Alaska's Best Wild King Salmon Jerky! 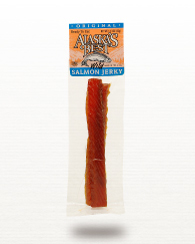 Trapper's Creek smoked salmon jerky is made from all-natural, wild salmon harvested from icy-fresh Alaska waters. Each salmon is hand filleted, carefully seasoned and slow smoked over cherry and alder wood for over 24 hours. Perfect for a healthy, easy and delicious snack -- it's loaded with Omega-3 fatty acids and packed with great taste! Select 6, 12, or 24 packages of 1 oz per order. Please order Original, Peppered, or Teriyaki. From adavey of Albany, New York on 10/7/2015 . 11/4/2015 – What is the sodium content by Oz? Also, is it possible to send the nutrients list?